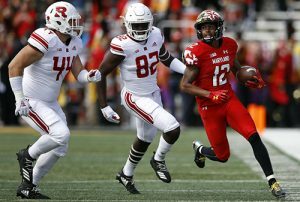 While the Terps didn’t get a shut out victory today for Homecoming in College Park, they did how ever handle the Scarlet Knights with precision in the second half that involved a very fluid offense and some great defensive secondary play. This was the total combo that Coach Matt Canada and his troops seemed to leave out last week against Michigan. After the game Canada complimented his defense that came to play again today and helped the Terps offense pick its game up. “They were around the football. When you are around the football, good things happen,” said Canada. Really proud of our defense and how they played today. Rutgers has lost five straight contests after an opening-week win over Texas State on Sept. 1. The Scarlett Knights went 4–8 in 2017, going 3–6 in the Big 10. The biggest stat of the game that shows that the Maryland defense was the key to victory was that they held the Scarlet Knights to just 8 yards passing. Yes, that’s a correct stat, just 8 years from Tino Ellis, Byron Cowart and Tre Watson, who also all threw from one inception. This is the fewest yards it has allowed since 1980. Just when you thought it couldn’t get any worse for Rutgers on their attempt to get the ball in positive territory, back-up quarterback Giovanni Rescigno was interception on his only pass of the day. The biggest take away from today was the Terps were able to hold Rutgers scoreless until the final minute of the game and the play of Ty Johnson. When Johnson stepped off the field today tallying nine carries for 132 yards, he had become just the fourth Maryland player to notch at least 4,000 career all-purpose yards, that adds him to the list that includes Torrey Smith, LaMont Jordan and Stefon Diggs. That’s some pretty good company. Another question that will likely loom this week is who Canada will use at the quarterback spot next week for yet another road game. Maryland quarterback Kasim Hill had an average performance at best. He overthrew receivers multiple times, sometimes when they were wide open, and completed 8 of 17 passes for 76 yards. But he also recorded a career-high three passing touchdowns to equal his total from the first five games of the season.